You've got the ultimate road trip playlist and the ultimate road trip snacks. 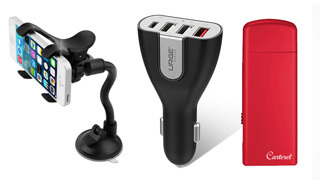 We'll take care of the ultimate road trip gadgets. Grab these three deals, save up to 73%, and start planning your itinerary now. You won't have to stop to ask for directions. Just attach your phone to this convenient universal car mount and pull up your maps app. 360-degree rotation ensures you drive safe while getting a great view of the screen (and the road), and the slip-resistant rubber pad will stay put on long drives. Get it for just $12.99, or 73% off MSRP! Never run out of juice on your devices while on the road again. This portable, compact charger powers up to three phones and one laptop at the same time-so don't worry, you find yourself stranded without GPS (or your Spotify playlists) anytime soon. Get it for just $19.99, or 50% off MSRP! It's TSA-approved, wind-proof, and gas-free, so you can take it (and use it) anywhere. Charge this lighter via USB and you'll get up to 50 uses between charges. Get it for just $11.99, or 40% off MSRP!